This blog post is the third of three that details the main findings from Imaging Sheffield — an ethnographic study that formed part of the Picturing the Social project at the Visual Social Media Lab. 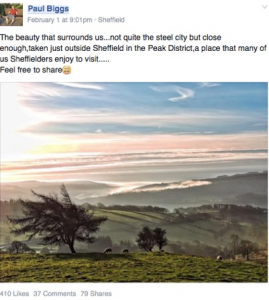 The aim of the Imaging Sheffield study was to find out some of the reasons why social media users share images of Sheffield online. 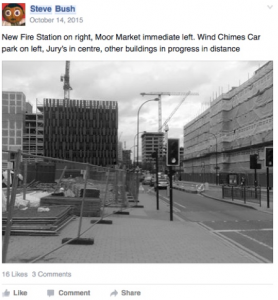 This last case study looks at a Facebook group, Pictures of Sheffield Old and New, and enables me to consider how photographs are used to create a dynamic historical record, and to enact various forms of sociality. This is a sizeable group, with over 27,000 members, and more than 180,000 images posted since it started in 2008. Whilst researching this group, I spent 12 months observing the group’s activities, and posted numerous times myself. I also conducted in-depth interviews with members of the group — Paul, Julie and Steve — as well as with the two moderators, Jim and Hedley. In terms of content, two themes dominated the group, relating to history and the countryside. Moderator Jim suggested that photographs formed an important visual record of places, and the ways of life associated with them, that served as a reference point for both contemporary and future viewers. Both he and Hedley took extensive photographs of the city’s Castle Market prior to its demolition, seeking to preserve something of the building for those who had known it. As Jim described, the market had been an important social hub within the city, and although falling into disrepair in the years prior to its demolition, its loss was keenly felt by those who had worked and shopped there. There is a history of Sheffield there on that site that’s never existed before… I can imagine for younger people just looking through those photos that will give you a tremendous history of Sheffield and not the kind of history that you would get in a published book. In particular, he saw the site as offering an opportunity for documenting change in a variety of ways, both as it happened, and in retrospect. The image below, for example, depicts some building work taking place in the city centre — Steve posted this image to the group once the work was completed, thereby recalling the recent past in a way that would now be interesting to compare with the contemporary street scene. By intentionally creating documents that they feel will have historical interest and value for others, Jim and Steve are fulfilling a dual social role: for both contemporary viewers, and for those anticipated in the future. Therefore images of the city need to be approached both in terms of the interaction they facilitate now — for people who live or have lived within the areas depicted — as well as the function they will serve for future communities. 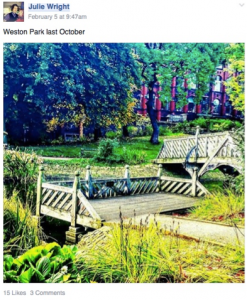 In just one three month period of observation, from 1st August to 31st October, there were 3,061 images posted to the group; 655 of which were on the theme of countryside or parkland, and 314 were of wildlife. To understand why this was the case, I asked my interviewees what the countryside meant to them. That’s Sheffield’s playground…all generations of Sheffield people have always used the countryside…that was their escape. Therefore sharing images of the countryside around Sheffield was not just a celebration of its aesthetic beauty, but also served as a continuation of traditions that extended back over a century. For Julie and Paul, however, the appeal of the countryside lay in its contrast with the city. In my interview with Julie, she described being amazed that a particular scene, below, was so close to the city centre. 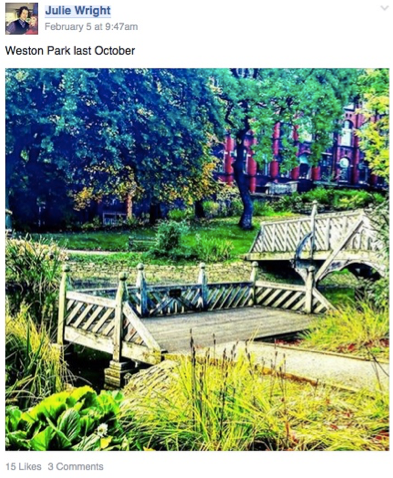 I took a photograph of [Weston Park] once … and it looked a bit like a Japanese garden and I just thought, how can that be so near a city centre, an industrial city centre, a city of steel? In all three examples, posting images of the countryside acts as a statement about Sheffield’s physical and cultural identity — something that either comes as a pleasant surprise, or that continues a long-standing, and socially important, association. You get people that are in their sort of seventies, they can’t get out themselves and they sort of say they love the views, and they’ll say it brings it into their home… So I’ll head up there and take pictures because I know that people will be interested in it…. one or two are house bound or in wheelchairs … and they just like to see what they can’t see. I think the service that you can provide … to make people aware that these things are happening, they might not necessarily know about it, or if they can’t go, they’d like to see the pictures wouldn’t they? In this way, photography is more than just a series of interesting images — rather, it serves a specific social function by responding to the viewing needs of others. Making people view things differently… Like the street art thing has changed a lot of people’s perceptions of graffiti. Here, visual representation within the group is used as a means for changing perceptions, and for shifting the ways in which certain concepts — and indeed certain communities — are conceptualised. As this case study shows, images of Sheffield are used within the group to serve a number of functions: to document, to inform, to include and to persuade. Again, this kind of perspective is enabled by an in-depth qualitative approach, in which images shared online are treated as the beginning of the story, and not as stand-alone texts in themselves.